Ruffa participated with her Aunt Sheila (a member of SALT) in a Lobby day in Albany for the Census 2020 as a representative of Manny Cantor Center Volunteers. Why did you participate in the lobby day? And, what was the experience like? “I have always felt that until one exhausts all their options, they did not do their best. As arbitrary as that might seem, it’s crucial to do the utmost as a civilian for one’s community. The lobby day was crucial in that people directly told their representatives about their concerns and I wanted to be a part of it. I believe that, that was one of the best ways I could do my utmost to help my community. It felt like I was a part of something larger than me and I enjoyed it immensely. I loved being there with like-minded people who represented underrepresented groups of people. Margaret: “I started volunteering because Why not? I was retired and someone told me about the center. My favorite part of volunteering is greeting people, talking to them, having an activity that you look forward to in the morning. Giving back to the community and interacting with really great people, everyone here is great. I love it! Volunteering to me means looking forward to something in the day, doing something I really like that I enjoy and feel good about doing. You can’t explain it in words, it’s such a joy. Helaine: “I started volunteering when I became retired, I used to come to lunches before this center was renovated and I wanted to get involved more. My favorite part about volunteering is serving people food, and hearing their appreciation for that. Love volunteering here! To me, volunteering means feeling useful, feeling happy that I am serving others and myself. It’s a big deal to volunteer, a deal that you like doing. Volunteers are integral to the work we do at Manny Cantor Center, our spotlight series provides an opportunity to share the stories of why community members volunteer, what they gain from the experience, and the impact they are able to make. Since it is National Volunteer Week, we decided to spotlight three volunteers this month. We are so thankful to all who choose to come through our doors to help build the community we want to live in, and are thrilled to celebrate you this week, and every day. 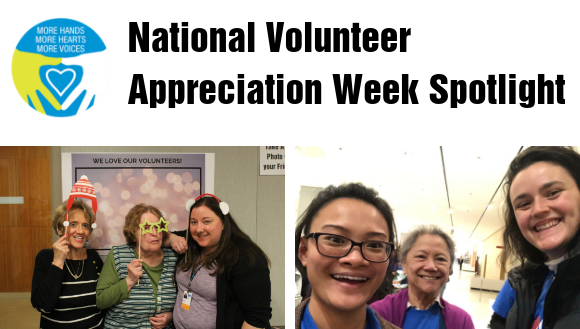 No Comments to "Special Edition Volunteer Spotlight: National Volunteer Appreciation Week"